is interested in proposing for your daughter for his son Capt. 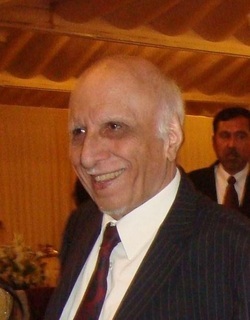 Rafique Ahmad Bhatti. What do you think?. The Boy’s age is 30 years. Received your card which delighted me. Everyone at home is fine and hope that you are also well. There is no doubt that away from home, you must have difficulty in getting good cooked food on time and days and nights must also be unbearable but my son, one must remember that neither is comfort nor discomfort remain forever. These phases come and go. This is an opportunity for you to serve your nation and country. You should work wholeheartedly and with dedication. Have a good relationship with your superiors and also have a friendly relationship with your subordinates. Without any discrimination of faith and community, you should have a sympathetic attitude towards every one. If you help someone, he will appreciate your friendship. Never allow pride to enter your heart or mind. Pride is a fore runner of difficult life. Love and good manners are a great blessing. After some time, if there is need so as to provide you home cooked food on time, we will all come to Kohat. I will write to you then to find a rental place and call us over. I insist on reminding you never to show carelessness in offering of regular prayers and fasting. These are difficult times. At such a time, how can any wise person become careless about God when there is none other than Allah who can help any one or save one from difficulties. Therefore, continue to knock on His door. My Daada Abba’s letter #2 Dated 12 August 1942 to my Abba Jan posted in Kohat at the time. May Allah be your guard and helperThrough your postcard, I got news of your well being and I was very glad to learn that you have started praying regularly. May Allah give you steadfastness. My dear son, stay happy. Being cheerful is good. However keep in mind to stay away from bad company and such groups. In all difficulties and distress, it is natural for a person to turn to Allah, the real bravery is to not to ever turn away from the gate of the All Powerful in any state whether of comfort or discomfort. He honors and He degrades. There is no doubt that at this time we are passing through a very delicate period. Man has become totally disobedient to God and has made Him angry. The cure of this also lies with Him. A momin’s heart is at peace if he always remembers Him. You must have read in the newspapers about the troubles that are arising in India now. About this, the current advice is that one should stay away from Congress Newspapers. These people are not only enemies of the government but due to their madness, are also enemies of the country and nation. When you have time, pray during the night saying “O Benficient and Merciful God, we have no security other than you, forgive our sins and mistakes. Have mercy on us and our country and at this difficult time, we ask for your special help”. he also graced the Walima reception held at Dr. Shah Nawaz Khan’s house in Dar-ul-Rehmat (Wasti), Rabwah. Died at the age of 90. He was a devoted and passionate Ahmadi. 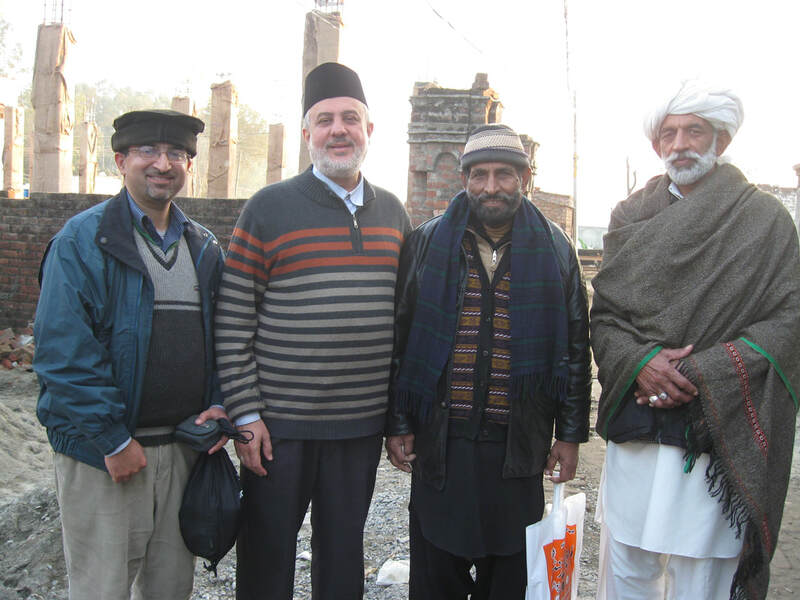 He remained the President of Jamaat Ahmadiyya, Chawinda for 20 years. 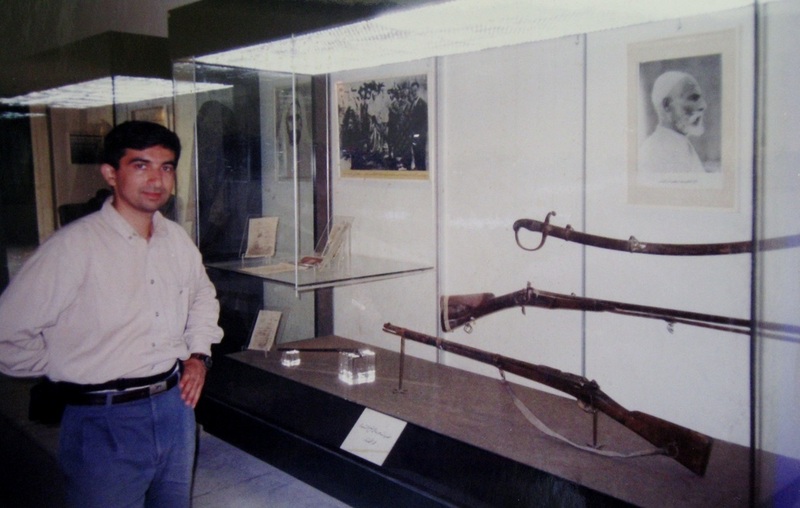 Karam Ilahi Zafar sahib (RA), Missionary Spain. In front of Id Kah Mosque, Kashgar, China (built in 1442). This is Xinjiang and Central Asia’s largest mosque. Abul Munir Nur-ul-Haq sahib and Maulana Dost Muhammad Shahid Sahib. With a group of Palestinian Muslim brothers after a series of dialogue sessions on Ahmadiyyat and the truth of the claims of the Promised Messiah in Jan. 2011. An Azerbaijani couple in front of the Ahmadiyya Mosque and Community Center, Baltimore, Maryland, Feb. 6, 2011. Mr. Eldaniz Ahmadov Vahidbeyli is a Lawyer and a Cinema Critic and Ms. Shahla Ismayilova is the Chairwoman of the Women’s Association for Rational Development (WARD); Adviser to the Global Fund for Women (GFW); and Lobbying Adviser to the Human Rights House Foundation (HRHF) Baku office. Shahla is the Coordinator of several national networks, such as Power Ladies (an affinity group for European Feminist Forum) and the Women’s Solidarity Network. Shahla is the Founder of the first Maternity School in Azerbaijan – a pioneering initiative in the country, which has growing interest and positive public feedback in Azerbaijan. At the moment Shahla’s specific focus is the capacity-building of women’s organizations in Azerbaijan. Among a number of initiatives she undertakes in this area is the creation of the Gender Expert Group – the first capacity-building infrastructure in Azerbaijan with gender as the main focus. Tabligh on the streets of Baltimore in the Mobile Tabligh Trailer. Mr. Rajab Khatib from Zanzibar, Africa is an Islamic scholar and a historian of Islam in Africa and America. He is currently researching to publish his article on Ahmadiyyat in Maryland. 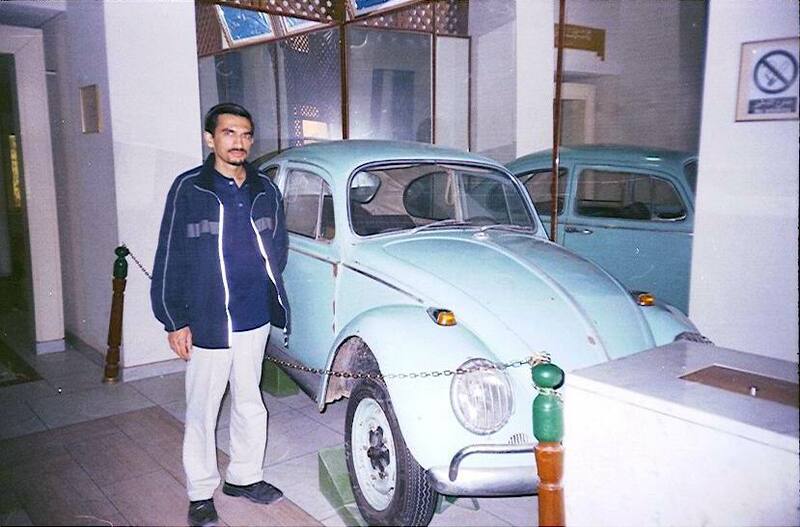 at Dr. Khalid Ahmad Ata’s Wedding in Rabwah (1981). Left: Brig. (R) Muhammad Salim S.I. (M), Ph. D., D.Sc. 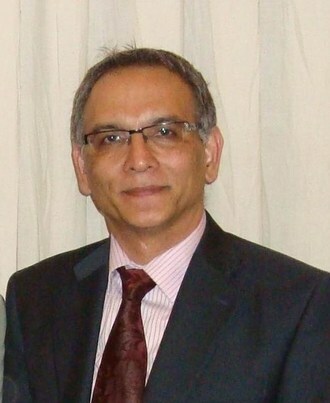 A leading anesthesiologist and one of the pioneers of Acupuncture research and practice in Pakistan. Right: Lt. Gen (R) Dr. Mahmood-ul-Hasan, Ex. Director General Surgery, Pakistan Armed Forces and Emeritus Professor of Surgery at Army Medical College and Armed Forces Postgraduate Medical institute, Rawalpindi. Ex. 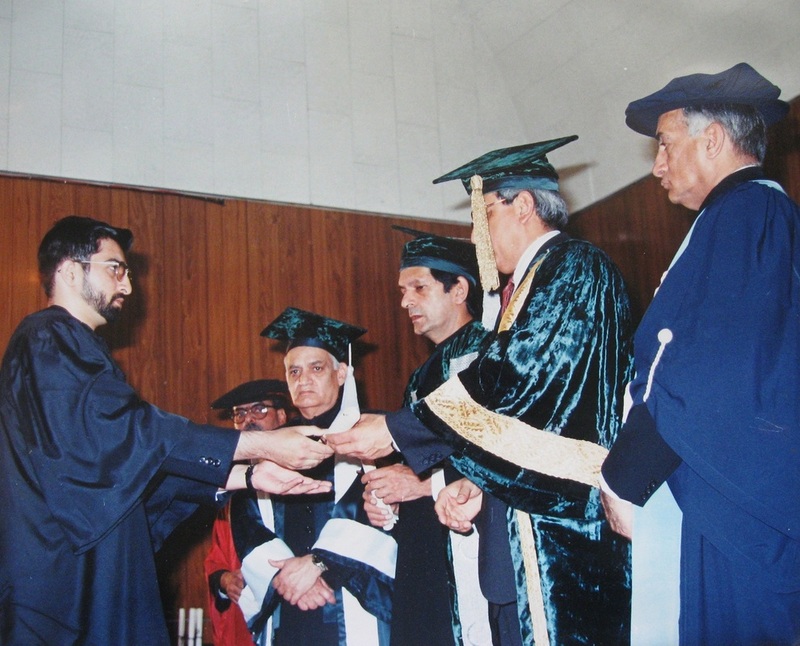 Honorary Physician to the President of Pakistan. Dr. Tariq Ramadan is Professor of Contemporary Islamic Studies at Oxford University (Oriental Institute, St Antony’s College ). He is also teaching at the Faculty of Theology at Oxford. He is at the same time a Visiting Professor in Qatar (Faculty of Islamic Studies) and in Morocco (Mundiapolis) and a Senior Research Fellow at Doshisha University (Kyoto, Japan). Professor Tariq Ramadan is currently President of the European think tank: European Muslim Network (EMN) in Brussels. He is the maternal grandson of Hassan Albanna, the founder of Muslim Brotherhood in Egypt. After a dialogue session on Islam with the Messiah Lutheran Church members on the evening of March, 23, 2011. “Victory of Islam” on the evening of Friday, April 15, 2011. Stitching a lacerated face of a Pakistani soldier. 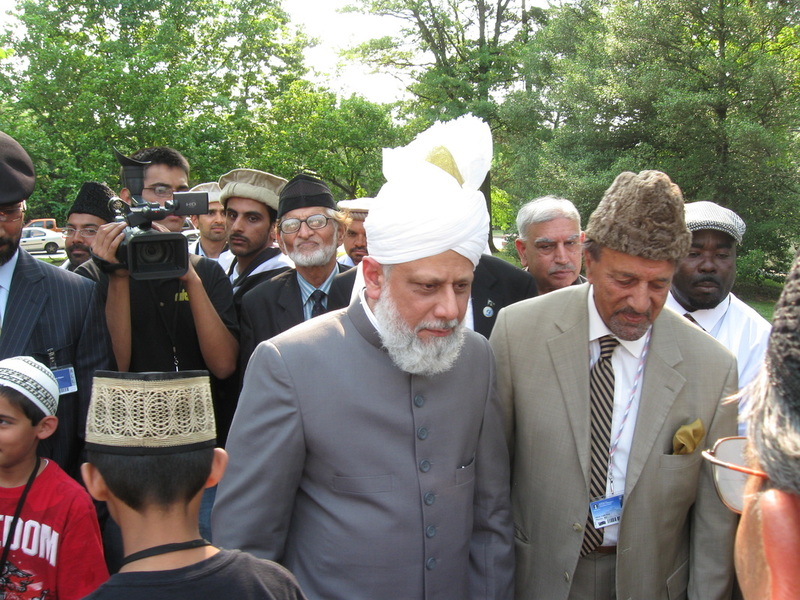 Hifazat-e-Khaas Team, Jalsa Salana USA – 2008. 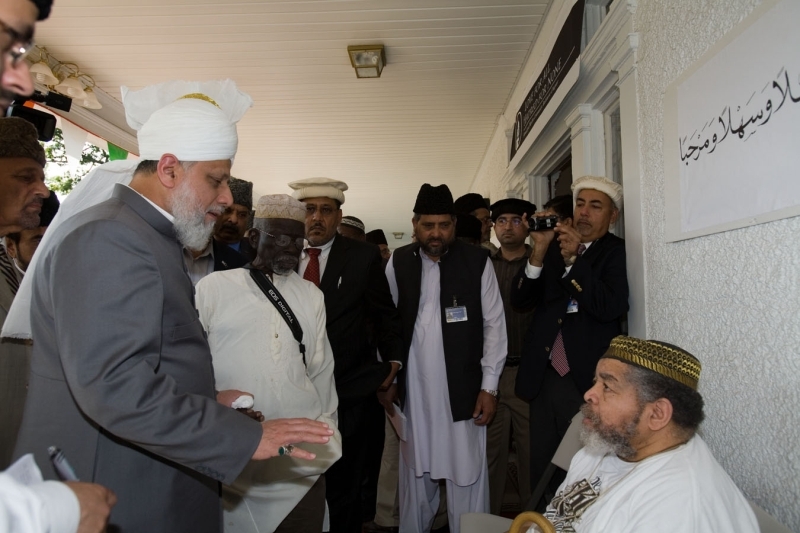 Dr. Farid Ahmad sitting on the right side of Hazoor (ABA). 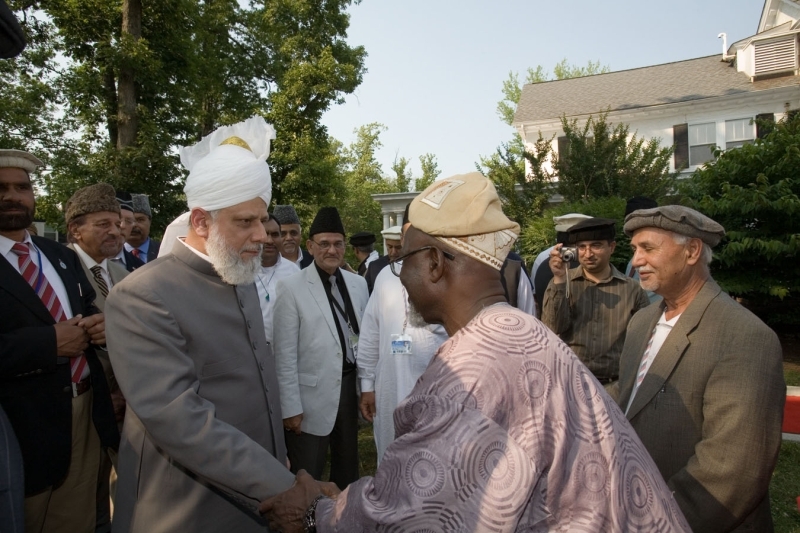 Meeting with Hazoor (ABA) at Baitur Rehman Mosque, Silver Spring, Maryland on June 21st, 2012. At the Office of Dr. Agha Shahid Khan (President, Mid-Atlantic Neurosurgical Associates), Sinai Hospital of Baltimore, MD. In front is the architectural model of his Raheem & Hafeez Hospital for Special Surgery in Accra, Ghana – InshaAllah. Photograph taken on May 23, 2012. 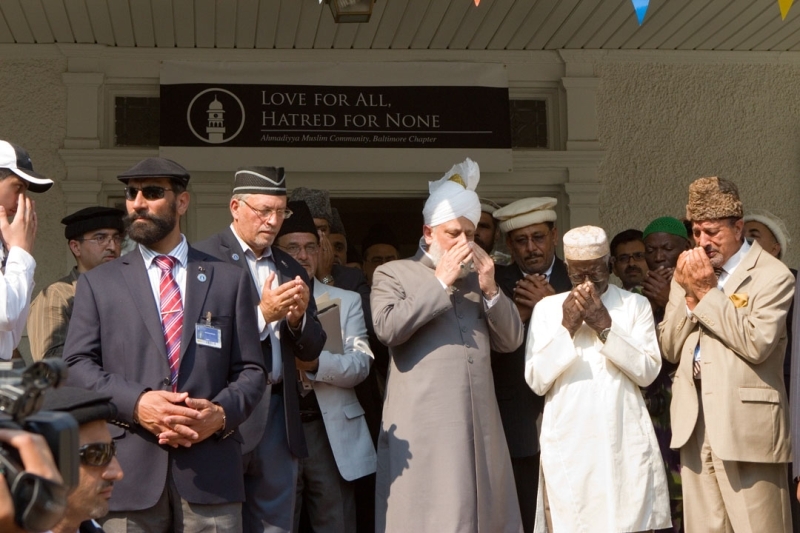 Prayers after naming the Pikesville Mosque as “Baitul Kareem“. Meeting a guest from Nigeria (Brother of Brother Aina). Ex-Ameer of Nigeria. 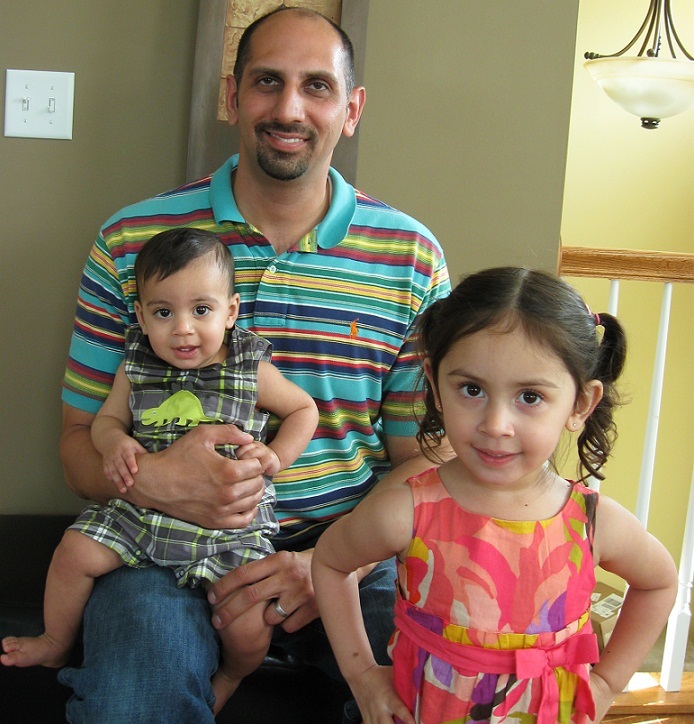 Mr. Mukhtar Bhatti has six master’s degrees to his credit and is currently pursuing his doctorate. 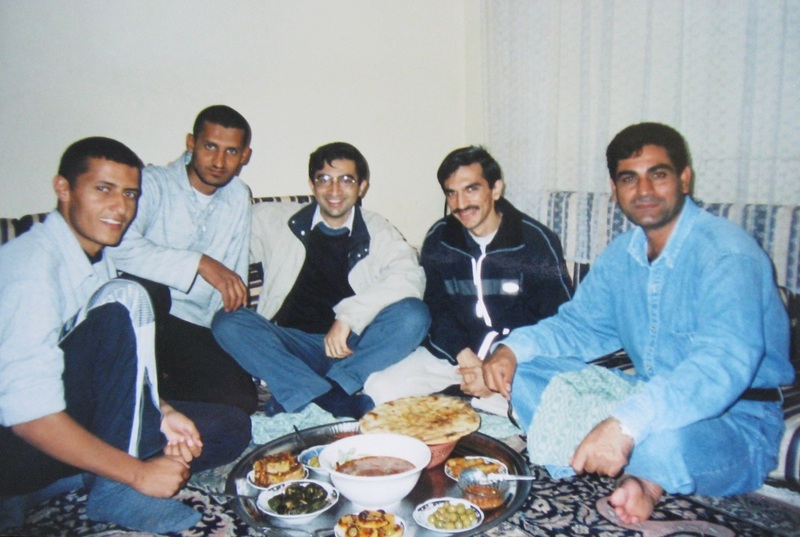 Traditional Libyan Dinner – Dr. Muhammad Al-Muqarram (2nd from the Left) is the host and Ustad Sameer (1st from the Right) was the Professor of English from Iraq. 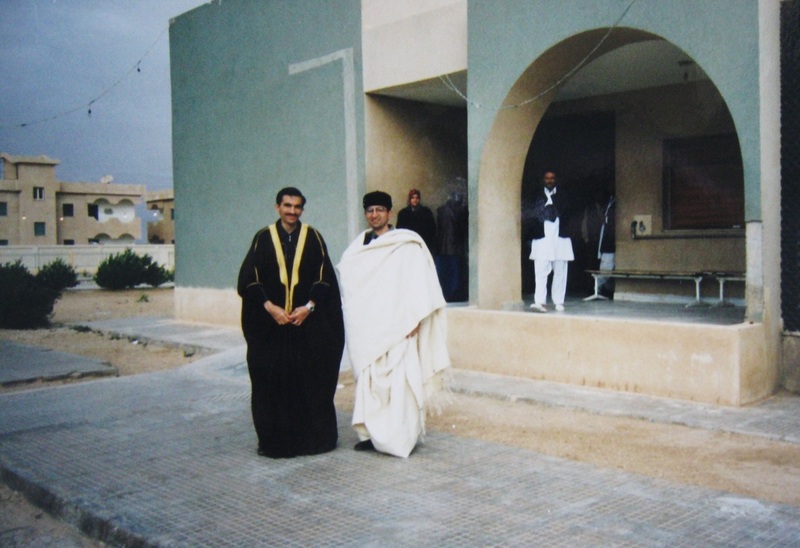 Traditional Arabic and Libyan Attire – In front of the Tiji Government Hospital in District Nalut. On the left are the residential apartments for the doctors. 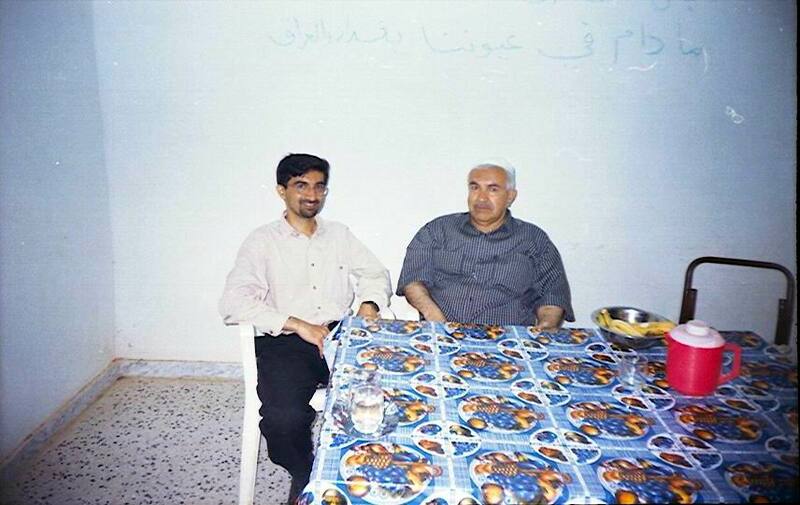 The Professor of Arabic from Kurdistan – Ustad Muhammad who used to watch “Liqaa ma Alarab” at his house via Hotbird satellite and wanted to meet Hazarat Mirza Tahir Ahmad (RA) – The fourth Khalifa in London after his retirement from Libya. 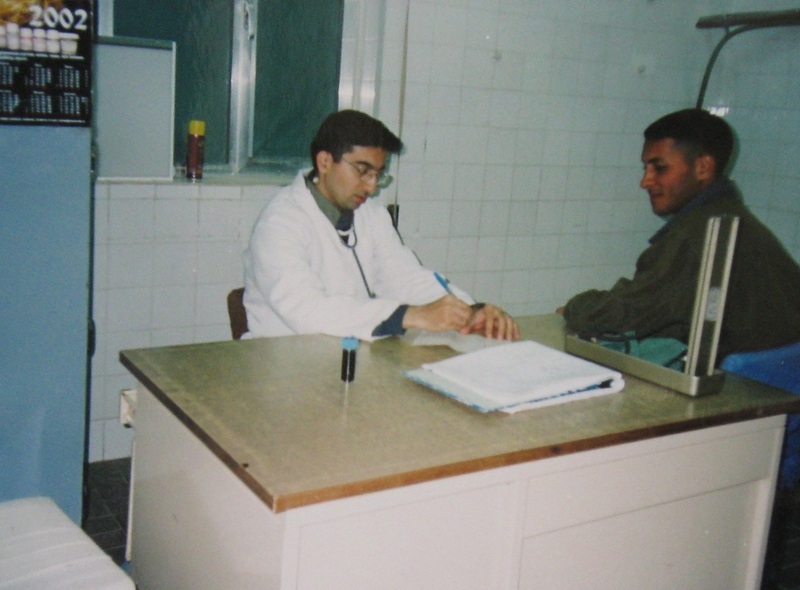 In side the Tiji Hospital at the Clinic of “Tabeeb-e-Aam” – The General Practitioner. 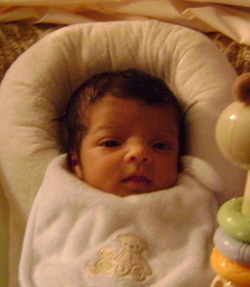 Dr. Rafae Bhatti works at an enterprise software firm in the bay area where he is engaged in research and development. He has previously worked at a prestigious industrial research lab where he pioneered solutions for healthcare security and privacy. He has published extensively in world renowned conferences and journals on topics of information security and privacy, and has recently published a book. He has given invited talks at numerous universities across the North America, the most recent being on healthcare privacy at Canada’s top ranked Computer Science department at University of Waterloo. He is also an Adjunct Professor at Santa Clara University. Among several local and national honors, Dr. Bhatti has been recognized by the US government in the prestigious category of “Individuals with Advanced Degree and Exceptional Ability in the National Interest”. 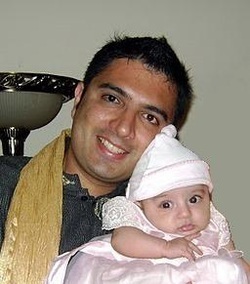 Dr. Bhatti earned his doctorate in Computer Engineering from Purdue University. at the Jalsa Salana 2008 at Harrisburg PA., USA.